The Santa Cruz River flows from the Argentino Lake towards the Atlantic Ocean for approximately 240 miles. This mighty river is home to the only Steelhead run on the whole Atlantic coast. From late February to May chrome bright Steelhead enter the river from the ocean in huge numbers. We’ve been able to set our cabins next to probably the most productive piece of water in this river due to its structure holding and spawning water. Our fishing has been divided into four different beats and over 30 named pools. Guests will rotate among the different zones to fish the most productive pools and runs. In case of difficult weather conditions, we’ve made a river road that parallels beats 2 and a part of 3, accessible by truck and only a few minutes away from the cabin. Steelhead on the Santa Cruz hit the fly hard and because of the powerful environment they live in, often run out huge lengths of line in acrobatic fashion. Once you hook a fish, your life won’t be the same. Some of the strongest and biggest fish of Patagonia swim upstream every year to spawn. The takes are aggressive and the flow of the river can make you get rapidly to your backing. Chasing these fish is a profound experience and the magnificence of the river and landscape will make you feel its magic. 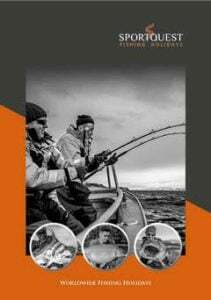 If you have any questions on any of fishing trips we offer then contact us in the office, our experienced team will be happy to help you with any queries you have. Additionally, you can request a free brochure. You can see all our Fly Fishing destinations in Argentina here. Los Plateados River Cabin is located 50 miles upstream from the rivers estuary. The accommodation is arranged for 4 anglers in two double rooms. Simple, but comfortable, the cabin has everything you need. There is a nice wind-protected veranda overlooking the river. Hot water always available for showers. A generator supplies the electricity and the power is 220 volt. Both breakfast and dinner will be served in the Cabin. An argentine chef will take care of the meals, where some of Argentinas finest beef and lamb will be prepared with vegetables grown in the lodges own greenhouse. Lunch is served by the river side to get the most of the fishing day. After a day of fishing, you get back to the cabin, where the warmth of the fireplace and a glass of wine are always there for you. There will be a satellite telephone in the lodge for outgoing phone calls. You’ll also find anything you might need at our fly shop in the cabin. We use a variety of Hotels in Buenos Aries for your overnight stay, from hotels close to the airport to hotels in downtown Buenos Aries that allow you to see a bit more of Buenos Aries and even extend your stay. All hotels that we use are a minimum of 3 stars and will at least include all the basic facilities listed below. If you wish, we can discuss, which hotel to use to suit your own personal requirements. Also, for overnight hotels, there is always the option to upgrade to single rooms. Although the fishing has set weeks, we have daily flights departing from the UK, therefore should you wish to either extend your stay with additional days at the beginning or end in Buenos Aires, the itinerary below can be tailored to suit. It is also possible to combine Steelhead Fishing with Golden Dorado, Sea Trout and King Salmon fishing. You can even combine all our Argentina fishing packages with any of our shooting packages to make the ultimate trip. Note: We also offer half week fishing packages on this destination, please ask for more details. On arrival take a taxi to the Jorge Newbery Airport. On arrival our staff will be waiting to transfer you to your overnight hotel. DAY 3: (Saturday) Fishing Day. On arrival there’s a short briefing about the coming weeks fishing. Once everyone is ready, it will be time to hit the home pools with your guides. For each days fishing we suggest you bring double-handed rods. Fly rods in 8 or 9 wt. Skagit lines with assortment of tips for the different types of water. Flies in black, blue, fuchsia, red etc. make great contrast with this milky glacier water. Fish slow while working your way downstream along these massive runs and pools. Swinging flies works very well, but don’t hesitate in stripping, as it can trigger some fierce takes. Fishing each day is only limited by daylight, so normally from 8:30 AM till 7:00 PM and lunch is taken beside the river. DAY 8: (Thursday) Fishing Day. Fishing is based on 2 anglers per guide and jetboat. We have divided the fishing in to 4 main beats, which between them provide 30 named pools. DAY 9: (Friday) Fishing Day. Fishing until lunchtime after which our staff will transport you to the domestic airport. On arrival take a taxi to your hotel. Take a taxi back to Buenos Aires International Airport.